I’m not sure if this book is still in print but both this and the first volume are books packed with stitches and well worth seeking out. Following up the first volume(link is to my review of this book) from a few years ago, Zimmerman has a second volume of stitches. This one covers diagonal, crossed, woven, tied and miscellaneous stitches. 433 stitched are diagrammed and pictured. There is a minimum of text in the book, although each stitch has a short description and a suggestion of coloring (number of values or threads). The diagrams are large, clear and numbered. Each stitch is also pictured. The stitched samples are stitched in a number of different threads, which is a nice touch. The names of the modelstitchers are listed at the bottom of each page. The book, for all its virtues has one flaw, which has been present in most of Zimmerman’s books: she does not name stitches. For example a stitch which in the book is called “Basic Cross Stitch Variation” (as are many others) is in The Needlepoint Book as Staggered Cross. While I realize and sympathize with the problem of one stitch being called by many names, having this information in the book would make it a far more useful tool. That being said, this volume, along with the first volume are great additions to the world of stitch dictionaries. 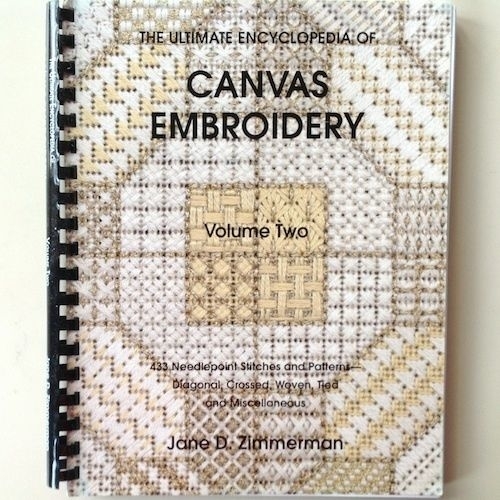 I found copies of this book at jane zimmerman.com, several needlepoint shops, and on Amazon. List price is around $50.